Following Douglas MacArthur's landings on the island of Leyte, a difficult task, the defense of his landed forces fell to the 5th United States Army Air Force. The Japanese had determined tha they must defend their positions on Leyte, regardless of the cost. 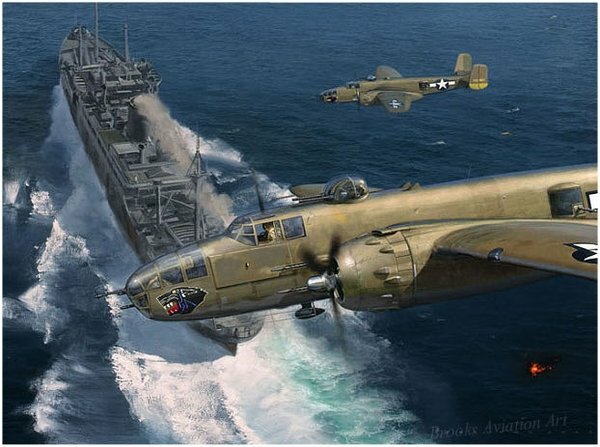 On the10th of November 1944, a furious fight took place at Ormoc Bay when a Japanese Reinforcement convoy was caught by elements of the 5th Air Force, including B-25Js of the 822nd Bomb Squadron, 38th Bomb Group. Nine Japanese ships were sunk and four were damaged, but at a high cost. Seven U.S. aircraft were shot down and eight were damaged. Overall size: 23¾" x 29"